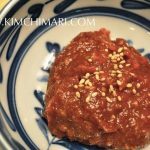 Ssamjang is a condiment used to add the final flavor punch to the Korean Ssam or lettuce wrap. Korean ssam usually contains rice, a kind of protein(bulgogi, grilled pork belly, kkongchi jorim and more) wrapped in lettuce or any vegetable leaf that is big enough to make a wrap. Ssamjang can be stored in the refrigerator for weeks due to the high salt content of the bean pastes. And since usually only a small amount is consumed each time, store the remaining sauce and use it later. Other ideas – just cut up some fresh carrots, cucumbers and even green chili peppers and serve with ssamjang. It can be a great side dish to any meat dish.